PlayStation Vue Expands Local Broadcast Stations With 200 New Additions Across the U.S. Following DirecTV Now's addition of numerous local stations for its customers, Sony this week announced the addition of around 200 new local network affiliates for PlayStation Vue users in cities across the United States. These include affiliate partners with ABC, FOX, and NBC in cities like Buffalo, Honolulu, Memphis, Austin, and many more. ABC affiliates on PS Vue now include Cincinnati, Ohio (9 On Your Side); Columbia, South Carolina (ABC Columbia); Corpus Christi, Texas (KIII-TV 3); Lafayette, Louisiana (KATC TV 3); and Baton Rouge, Louisiana (WBRZ 2). 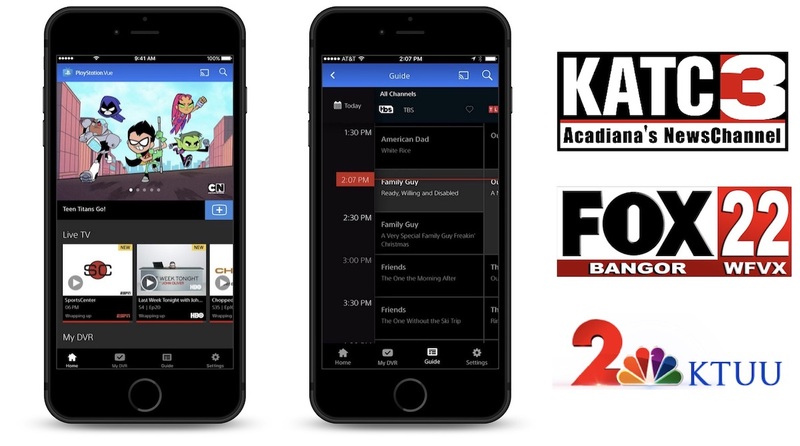 A few Fox affiliates include Bangor, Maine (FOX 22); Denver, Colorado (FOX 31); Eureka, California (FOX 28); and Jackson, Mississippi (FOX 40). Lastly, some NBC affiliates include Alexandria, Louisiana (KALB); Anchorage, Alaska (KTUU); Fargo, North Dakota (KVLY); and Lima, Ohio (WLIO). Check out PS Vue's FAQ page for the entire list of new local stations. I am excited to announce that PS Vue users in select markets will gain access to local broadcast stations at no extra cost, starting today. With this expansion, PS Vue now offers more than 450 local ABC, CBS, FOX, and NBC stations, in cities all over the US – from Buffalo, NY, to Honolulu, HI. As we gear up for football season and Fall TV premieres, now over 97% of the US population has access to at least one major broadcast station from ABC, CBS, FOX, and/ or NBC. Unfortunately, there are many local stations that are restricted from recording shows through PS Vue's cloud DVR, including every station listed above and what appears to be every station added onto the service this week. The company says this restriction is "due to streaming rights," and it also extends to certain on demand channels, HBO, Showtime, and Cinemax. With the expansion, Sony says PS Vue now supports "more than 450 local stations" from ABC, CBS, FOX, and NBC. Like other OTT services, PS Vue lets users stream live television through apps available on iOS, Android, Apple TV, and PlayStation consoles, starting at $44.99/month. Features include being able to stream on up to five devices at once, a cloud DVR, on demand content, and more. PlayStation Vue is one of the major live TV streaming services along with DirecTV Now, Hulu With Live TV, Sling TV, and YouTube TV. Many locals are independent... and thus deals have to be struck with EACH one. I haven't looked up the recent number but a few years ago, there were well over 1000 local stations in the U.S. Wait this lengthy page load out ('https://www.antennasdirect.com/hdtv-station-list.html') and then scroll down to get a sense of them all. Or just read the numbers on Wikipedia ('https://en.wikipedia.org/wiki/Lists_of_television_stations_in_North_America#United_States'). Now, some of these as a group are owned by single (parent) companies (like Sinclair, Tribune and several others), meaning, do a deal with one company and all of their (controlled) stations can be made available. However, many, MANY stations will require a deal to be struck with them... EACH of them. This is no small task. When Satts adopted local channels, it took many years for relatively strong, capitalized players to strike all of the necessary deals. And, someone correct me if I'm wrong here, but even after many years, there were still plenty of locals NOT available via Satt (though some of that by choice, due to the pinch of total bandwidth available via Satt). I actually think that entitles like Sling (via the AirTV and similar ('https://www.airtv.net/products/airtv/')) may have the best general approach to offering locals in streaming service packages, by building something to attach to an antenna that then weaves individual locals into the rest of the service. Note: in that, I'm not saying Sling is best... just that their approach to delivering locals may be the fastest way to getting the job done all over the country. This attempt to strike deals with every local broadcaster in the land is just a slow, SLOW model otherwise. Each of them wants to be paid well, even though their broadcast is available for free via an antenna. Each of them is going to want their sub channels carried too because that's more advertising slots to sell, and more eyeballs to claim when selling companies on paying for those commercials. I think Vue, Hulu, et all should follow the example from Sling and make AirTV-type products OR- better still- make their services play nice with generic boxes like HDHomeRun from Silicon Dust ('https://www.silicondust.com/hdhomerun/'). Otherwise, it's just going to take a very long time for each player to strike their own deals with each broadcaster so that all locals can be streamed without an antenna. Yes, I fully understand that many people want their locals without having to put up an "ugly" antenna... and that many other people are located in spots where they are unable to get all of their locals in a stable signal. The above is NOT saying to ONLY go that AirTV/HDHomeRun way, just offered as a fastest way to blanket the nation WHILE they continue to try to bring locals to all the other people who would rather stream them only... or could ONLY receive them via streams. Yeah, but you can not DVR any of them...really??? Youtube TV is way better. $35/mo and I have somewhere in the neighborhood of 70+ channels... shared with 6 household family members, 3 streams at a time... and pretty much the big 5 major locals/network affiliate from day 1.